The Peach and Polarn O. Pyret. In running and biking and climbing and giggling and being outside. Changes in weather can create new opportunities and games to play outside. 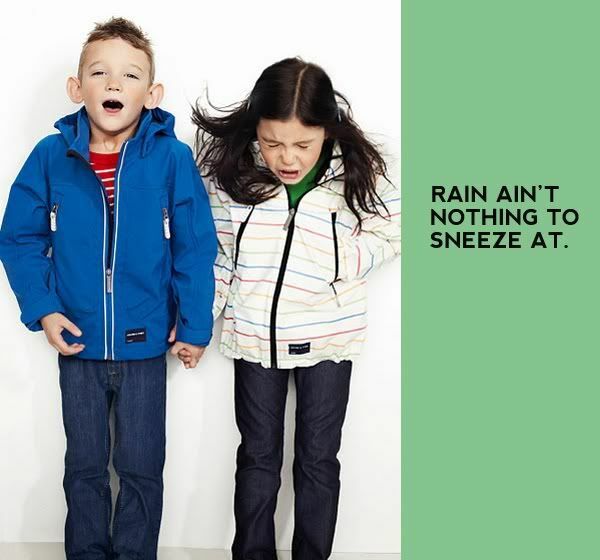 And with cool clothes like Polarn O. Pyret, kiddos can actually HAVE FUN outside in all sorts of weather. The Peach needs her outside play time. On the rare days she doesn’t get it, she is restless and crabby and doesn’t sleep well that night. It’s easy to just toss her outside and let her run around in the summer time, but when the rains (or snow) comes, it takes a bit more prep. Remember Ralphie’s little brother in A Christmas Story? And how he was so wrapped up that he couldn’t even get up, let alone have fun in the snow! And I’m sure he STILL was cold and had wet socks after all of that. That’s the beauty of Polarn O. Pyret! They get that it is not enough to make warm clothes, but clothes that are water and wind resistant and out of thin enough layers that kids can actually more and run have fun! Let’s take a look at the warm goodies that Polarn O. Pyret sent us to try out on the Peach. I’m really impressed by this jacket. It has a detachable hood and adjustable velcro straps at the wrists. And I love that the zipper has a little cover so it doesn’t rub against the Peach’s little neck. The angled pockets are easier for the Peach to get her hands in. And they zip shut! Yesterday she filled it with flowers from our fuschia plant. You can’t see it, but the there are gray reflective pulls and the gray accent across the chest is reflective too! Bonus points for style AND safety. The limey green hat is great because it covers her ears without being pulled down over her eyes. It’s called “the Flapper” and it really does make Miss Peach look like she’s wearing a stylish little cloche! Tee hee! I know what you are thinking… “Dottie,” you say, “Isn’t California too warm to worry about keeping the Peach from getting cold?” The Bay Area actually gets pretty cool in the wintertime AND summer. I have seen ladies rock fur coats in July in SF. And it gets pretty darn windy at the beach. And we love to go to the Beach in the winter. Much less crowded and still so much fun! And did I mention that it rains in the Bay Area? These, my friends are RAIN pants. (Happy dance!) And double happy dance for being windproof, so Ms. Peach’s legs won’t freeze when we put her in the bike seat for family bike rides. It gets pretty windy when you are biking and since the Peach is just sitting back there enjoying the view, she isn’t as warm as Mama and Daddy who are breaking a sweat peddling away! These pants are perfect for sploshing down wet playground slides and are light enough to wear year round, but can be layered to wear in much cooler weather as well. The Peach loves wearing them to the beach. I can’t wait to see how they will do in Colorado this Christmas with a few more layers! In honor of PO.P’s EVERY DAY IS A PLAY DAY initiative, I created the following video showing Ms. Peach playing her little heart out in her PO.P winter togs! Hee hee! Did you notice a certain Swedish band playing in the background? Heh! How could I resist? As Alix mentioned, head on over to the Polarn O. Pyret Facebook page and tell us what you did this week! You could win some cool prizes, like a PO.P goodie bag. To see more of their outerwear, check out the site over here. How cute is that little child? BRAVO Dottie for brining our first ever VIDEO POST!!!!!!!!!!! whoo hoo! Seriously? How can one kid be that dang cute n’ sassy? I’m so glad you understood the last comment. I was concerned! She. Cannot. Be. Any. CUTER! THAT is the CUTEST thing i have ever seen…! and where oh where, can i get those glasses???? I purchased those glasses last March from Gymboree but I’m sure they have more of them! I ended up buying three pairs–putting one in each car and a floater. Totally worth it. “Let’s do it again!” I’m gonna be trying The Schooch myself. Hee hee! I like that schooch too! Loved the video…our first of the Peach. She is adorable! Hi Alesia! So great to hear from you!